Male American goldfinch (willow goldfinch); photo by Dan Dzurisin on Flickr (noncommercial use permitted with attribution / no derivative works). 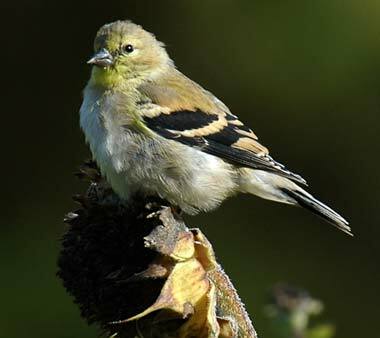 Also called American goldfinch or wild canary, the male willow goldfinch has a bright yellow body with black wings and tail, and black on top of his head. The female's plumage is more muted with an olive-yellow body and dark brown tail and wings (the male goldfinch also displays this same dull plumage in the winter months). Active and acrobatic little birds, goldfinches fly with a bouncy, undulating pattern The diet of the goldfinch consists mainly of seeds. 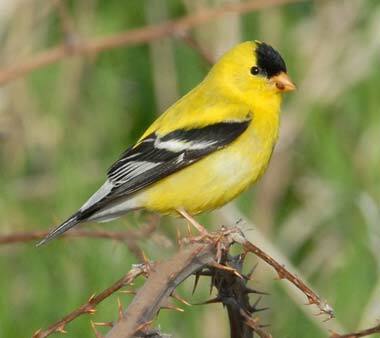 The American goldfinch is also the state bird of Iowa and New Jersey (both refer to the American goldfinch as the "eastern goldfinch").